Representatives of the French government and local activists signed an agreement Friday to end the month-long demonstrations and commit 1.1 billion euros ($1.2 billion) in immediate aid to French Guiana to improve public safety, education, transportation and address other grievances voiced by protesters. Activists dropped their barricades across the territory after signing the agreement, allowing normal work to resume Monday at the spaceport near Kourou, French Guiana, for the first time in more than a month. The strike began March 20 before an Ariane 5 rocket was due to roll out to its launch pad with Brazilian and South Korean satellites on-board. That flight was supposed to blast off March 21, but Arianespace suspended launch operations until the road barriers were lifted. With the spaceport operational again, Arianespace announced Tuesday that the Ariane 5 flight is now set for May 4. 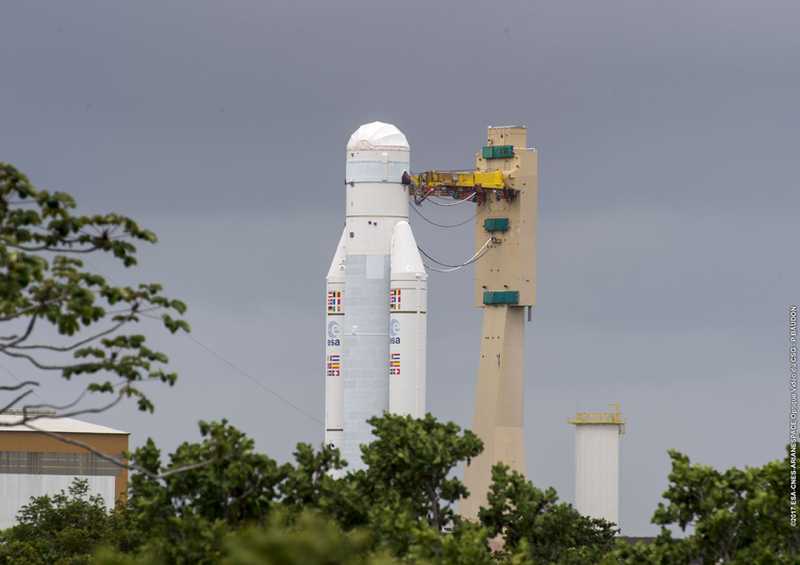 The launch window opens at 2031 GMT (4:31 p.m. EDT; 5:31 p.m. French Guiana time). 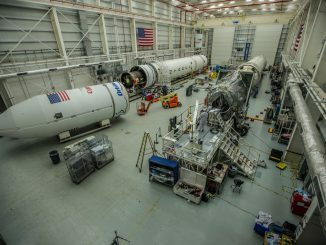 The 180-foot-tall (55-meter) rocket, already stacked with the SGDC and Koreasat 7 communications satellites, remained inside the final assembly building at the Guiana Space Center during the demonstrations. A detachment of the French Foreign Legion provides security at the space base. The Ariane 5 will make the 1.7-mile (2.7-kilometer) rail journey to the ELA-3 launch pad May 3 for final launch preparations. The SGDC and Koreasat 7 satellites, both built by Thales Alenia Space of France, are owned by the Brazilian government and South Korea’s commercial operator KTsat, respectively. Labor issues at the spaceport have pushed back launches twice before, in 1989 and most recently in 2011, when the operators of radar tracking systems in French Guiana went on strike, delaying an Ariane 5 flight by 24 hours. The Guiana Space Center is operated by CNES, the French space agency, with funding support from the European Space Agency. The launch of the SGDC and Koreasat 7 spacecraft was initially delayed by a strike of workers responsible for driving the Ariane 5 rocket from its assembly building to the launch pad. That issue was resolved within a few days, but a wider net of demonstrations across French Guiana spread, with many citizens raising concerns about the privatization of a local hospital, high crime and poor educational opportunities in the region, which is a department with the same political and legal rights as the rest of France. Protest leaders demanded more 3 billion euros ($3.3 billion) in emergency funding to improve conditions in French Guiana. The final agreement signed Friday calls for 1.1 billion euros ($1.2 billion) of immediate aid, and a “priority review” of another 2.1 billion euro ($2.3 billion) funding package. Arianespace chief executive Stephane Israel welcomed the news on Twitter. All open. Fulloperations restart Monday. We express to our dear customers our apologizes & we thank them for their support and patience. The May 4 launch will be the first rocket flight from French Guiana in nearly two months, but Arianespace officials say the company’s plan to conduct 12 launches this year remains intact. Before the delays, there were no launches planned during May and most of June. On the current schedule, Arianespace should be able to get back on pace by late June or early July. A Russian-made Soyuz rocket is next in line at the tropical space base, slated to loft the Boeing-built SES 15 communications satellite into orbit to provide in-flight Internet connectivity for airline passengers, and support government, networking and maritime customers across North America. SES 15 also hosts a payload for the FAA’s Wide-Area Augmentation System to enhance airline navigation and safety across the United States. 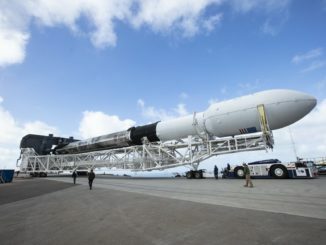 The launch of SES 15 was set for April 4 before launch operations halted. Sources said the flight is now expected May 18. That will be followed by an Ariane 5 launch in early June with the ViaSat 2 and Eutelsat 172B commercial communications satellites. That launch was originally targeted for April 25. Several satellite operators announced their intention to put their payloads on Arianespace rockets during the time the company’s fleet was grounded. 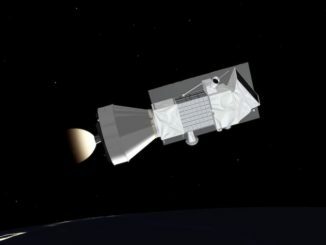 The Italian government announced earlier this month that two of its next-generation radar surveillance satellites will launch on Soyuz and Vega-C rockets from French Guiana in 2018 and 2019, and the European Space Agency said a small space telescope designed to study planets around other stars will blast off with one of the Italian reconnaissance platforms on a Soyuz mission next year. The Horizons 3e communications satellite, part of a joint venture between Intelsat and Japan’s SKY Perfect JSAT Corp., will launch on an Ariane 5 rocket in late 2018, officials announced last week.